John Saxby was the father of modern signalling. In 1856 he took out a patent describing a device as a ‘mode of working simultaneously the points and signals of railways at junctions to prevent accidents’. At the time he was working for the London, Brighton and South Coast Railway. In 1861 Saxby joined John Stinson Farmer and set up as Saxby & Farmer, working from their Patent Railway Signal Works in Kilburn. 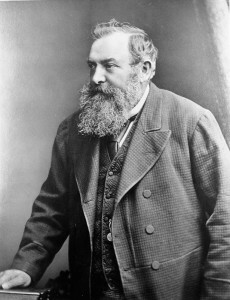 Saxby left the Company in 1888 and moved to Criel in France to manage the French business – he died there in 1892. Saxby was obsessed with Intellectual Property and actively chased down any Company that he believed was infringing his patent. In 1869 he sued McKenzie, Clunes & Holland for infringement of patent rights – and lost. In 1901 McKenzie & Holland, Saxby & Farmer, Evans O’Donnell of Chippenham and Dutton of Worcester joined together in what was to become the Consolidated Signal Company. This Company acquired over 90% of the shares in Saxby & Farmer who moved their operations from Kilburn to Chippenham in 1903. The various company names never however disappeared and in 1920 Westinghouse Brake & Saxby Signal Company was incorporated – keeping this name until becoming Westinghouse Brake & Signal in 1935. Saxby died in 1913 at home in Hassocks, Sussex. 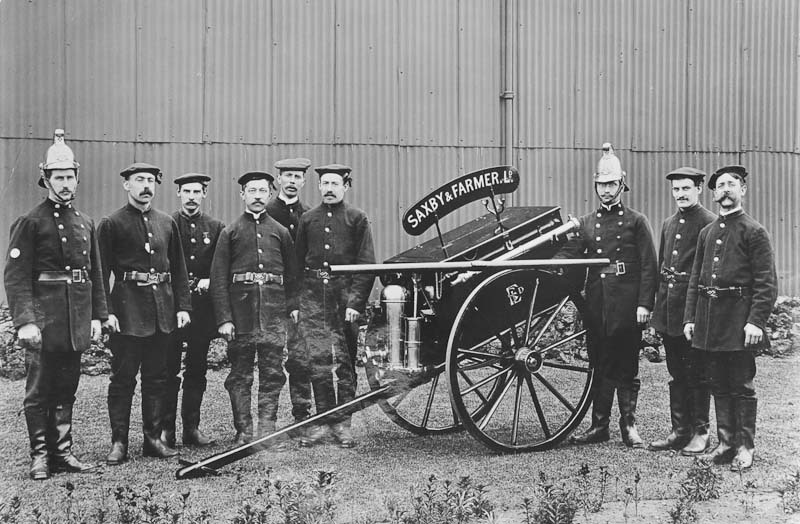 The S&F Fire Engine at Chippenham, approx 1905 (note the Evans O’Donnell monogram on the vehicle). 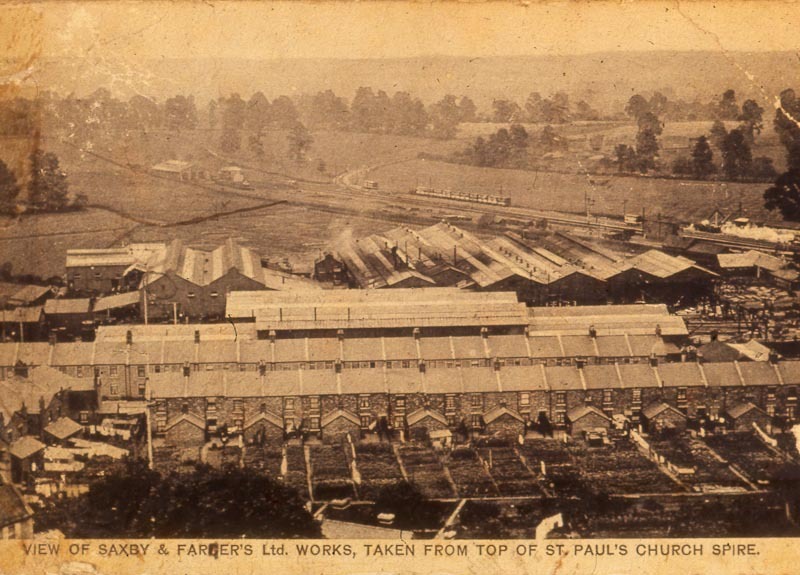 Taken from the unusual vantage point of St Paul’s Church, this view of the S&F works in Chippenham was captured by Thomas Haywood, an apprentice who became Chief Draughtsman of the Company before leaving to start up his own business. The Calne Branch Line stands out clearly, curving away from the Great Western Mainline. 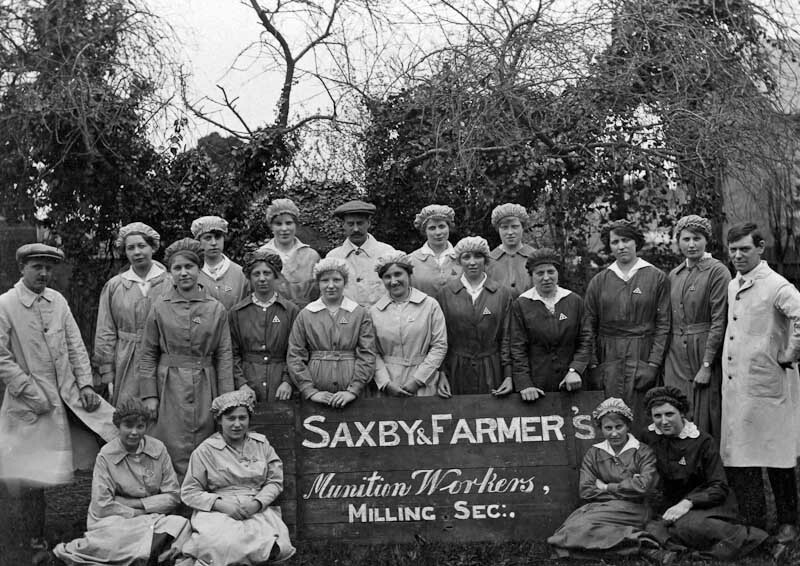 And the splendid women of the Milling Shop during the First World War.